We went to Portland, Oregon and all I got was an ironic, thrift store t-shirt. Portland is exactly what I think a town would be like if it were run by children. Every restaurant serves pizza, burgers and macaroni and cheese. If it’s at all possible to put a car seat on a unicycle, someone in Portland will do it first. A ridiculous, pretentious town were people say idiotic things like “I’m pretty religious about cassette tapes” and homelessness is the final stage of hipster. Needless to say, you’re better off staying in Seattle. But if you must visit, check out the Sapphire Hotel for a “You’re Not My Real Dad” cocktail. 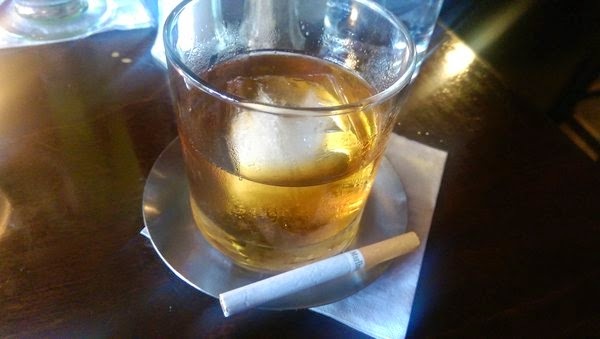 A cerveza that up until recently, was garnished with a cigarette. Turns out you legally cannot do that. Or you can just grab the recipe after the jump, turn on Portlandia and rock out to the October playlist featuring Weird Womb, LVL UP, Black Beach and No Bails. Garnish with a cigarette, serve on the rocks.